You can find bags of unadulterated popcorn. A serving of this WHOLE GRAIN is a mere 5 cents. Popcorn is dried corn - and when you pop it you are just heating it up. Of course this nutritional assessment is BEFORE you add the salt and butter which will turn a healthy snack into a treat. We used to pop popcorn on the stove in a couple tablespoons of oil before we learned some new tricks (and you don't need an air popcorn popper). 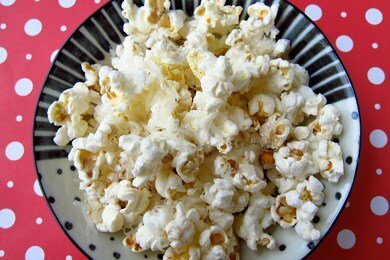 If you have a microwave oven, you can make popcorn with just a paper bag see: DIY Microwave Popcorn: Healthy, Yummy, and CHEAP. 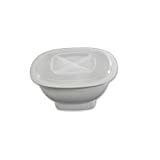 You can also buy the bowl featured below (reuse!) and pop it in there without any oil. Both the bag and the bowl turn out great tasting popcorn (you won't miss the oil or the flavored packaged stuff). You just have to be very careful not to burn the popcorn. In the bowl, it takes about two minutes and thirty seconds to pop 1/4 cup popcorn. I happen to love butter and salt on my popcorn, but I had to face a hard cold reality. If I use two tablespoons of butter, I am adding 204 calories and 23 grams of fat. So, I looked for a lighter alternative. Parmesan cheese is a great choice because it is flavorful and lower in fat than many cheeses. Two tablespoons of grated parmesan is only 43 calories and 2.9 grams of fat. I posted a maple syrup and peanut butter combo that is a family favorite - see it here: Makeover Kettle Corn Into "Can Do" Corn. What is your favorite way to flavor popcorn? Mix popcorn and cheese in bowl. Grind pepper to taste and enjoy! I still think extra virgin olive oil is a good addition in moderation because it has the good fats. If you get a mister (such as the Misto) you can spray it on so you're not just dumping a bunch in. I think even with seasoning it tastes much better with a little evoo. I took a tip from Good Housekeeping - a glass bowl, a tiny amount of olive oil (or, sometimes, just a spray or two of my olive oil spray mist thing from Trader Joe's), 1/4 cup of popcorn, a plate to cover everything, 4 minutes on high. Voila. No need for any fancy equipment and no worry about anything catching on fire. It's become one of our regular snacks in my house! i love it popped in the microwave, drizzled with melted coconut oil, with salt and pepper. I still have an old school air popper (with Scooby Doo on the outside ;) ). Just last night I made popcorn with nutritional yeast. It's awesome. I thought that paper bags contained formaldehyde or some other harmful ingredient. Am I wrong? I don't think I would be crazy about microwaving them. I pop popcorn every morning for my 5 kids with a bit of olive oil on the regular stovetop. I think the bit of good fat is fine for them...It is fantastic! Thanks for featuring popcorn! It is one of my "go to" snacks. I also had an Amazon gift card I wanted to use so I bought the popcorn popper that you featured for the microwave, thank you!! I love the woman's idea above of popping in the microwave w/olive oil and covering with a plate. Never knew that would work! I do not like microwave popcorn and have used the paper bag method for a long time. I use a little butter flavor spray and a sprinkle of salt. Target has some great low or no cal popcorn toppings to sprinkle on! I just put on a little bit of vinegar. Not too much or it becomes soggy, but just a bit gives it great flavor. You should never use microwave popcorn . there are so many harmful toxins. Also a really healthy snack should have a protein a fat and a carb. I like the idea of a little parm. or nutritional yeast. coconut oil and flax seeds blend really well to with a little cinnamon. I really like the Nordicware popper... I don't really HAVE many paper bags the right size and I have asthma so I can't use commercial microwave popcorn. I like to use Bacon Salt or Molly McButter with parmesan or romano cheese after misting with a little oil for a more salty type, and if you like Reese's peanut butter cups, misting with oil and then sprinkling in some chocolate PB2 is yummy! Nutritional yeast all the way! I recently discovered this yummy stuff and use it on my popcorn, salad greens, etc. I love my hot air popper for popcorn. I just use a few spritzes of extra virgin olive oil and a generous sprinkling of nutritional yeast. Yum!! About how much kernels gives you 2 cups of air-popped popcorn? In other words, what's a good ratio to use when determining how many kernels to microwave to get a certain amount of popped popcorn? I know some will remain unpopped, but I'm just looking for a rough estimate. I think the recommended serving size is about 1/4 cup unpopped kernels. It makes a lot of popcorn! I keep the leftover popcorn in a ziplock bag for a quick snack throughout the rest of the week. I love the nutrional yeast on my popcorn but I find that I have to have some butter or oil on the popcorn in order for it to stick to the popcorn to taste it?? Is that the same for the cheese and pepper or the other flavorings? What the heck is NUTRITIONAL YEAST?? I never heard of it! Also, just heard of PB2 on Dr. Oz last week and ordered it on Amazon last night - it hasn't come yet. Is it good?